Undercover police have conducted a sting operation posing as squeegee guys to nab drivers using mobile phones. An officer in a high-vis shirt and appearing to wear an ear piece was captured by an eagle-eyed photographer yesterday. 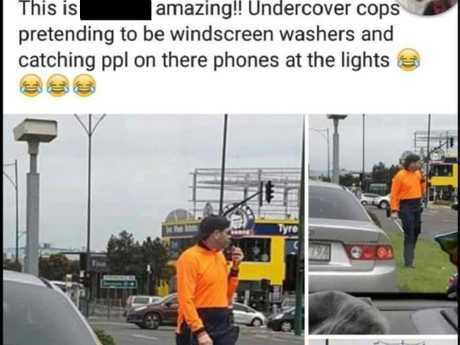 Victoria Police say the traffic operation, which took place at a major intersection in Nunawading in Melbourne's east, targeted "distracted'' drivers. "Part of the operation involved covert observations of drivers in stationary vehicles. Police issued 38 infringement notices to drivers for using their mobile phone while driving,'' a Victoria Police statement said. Facebook post exposing the sting. Picture: Facebook. The operation ran on Springvale Road and Maroondah Highway. It is claimed the undercover officers approached cars under the guise of cleaning windows but instead monitored if motorists were using their phones while driving. The undercover officers would then radio uniformed officers parked roughly 200m down the road, who would pull the driver over and issue the fine. Those caught using a mobile phone while driving are usually fined $484 and have four demerit points deducted from their licence. It is estimated the sting operation netted $18,392 in fines. However, what is not known is how much the undercover cops made in tips from cleaning car windows.